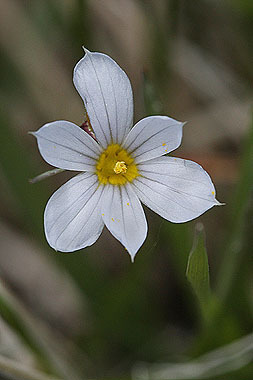 Sisyrinchium pallidum is a rare species which looks similar to Sisyrinchium montanum but with pale blossoms. Both species grow in moist grassy meadows and Sisyrinchium montanum is often found growing where Sisyrinchium pallidum occurs. Pale Blue-eyed-grass has been found in South Park, Rocky Mountain National Park, Saguache County, El Paso County and Soapstone Natural Area in Larimer County.